More than great wealth, philanthropy requires a generosity of spirit and the desire to improve the quality of life for others. 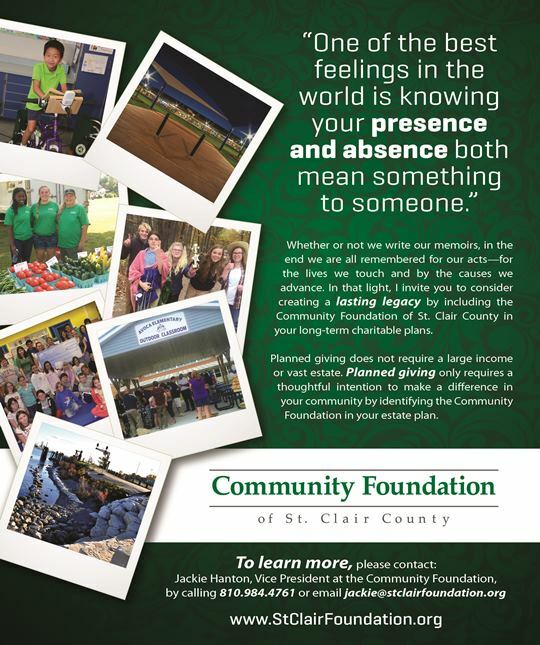 The Community Foundation of St. Clair County’s Legacy Society recognizes and honors those donors who have made plans through their estate to give back to the community through the Community Foundation. We are grateful for their foresight, dedication and philanthropic spirit. Planned giving does not require a large income or vast estate, but only a thoughtful intention to make a difference in your community. Members of the Legacy Society recognize the importance of making a future gift through the foundation, and with their leadership they encourage others to do so as well. Their planning today will benefit our community for generations to come. Through the Legacy Society the names and spirit of our supporters will be forever honored.